This is a simple recipe I put together. It's great for a night when you are really pushed to get dinner on the table. You can bake it ahead of time and rewarm it and no harm done. There are no fussy ingredients. Yes, the rice is a little bit funny colored. 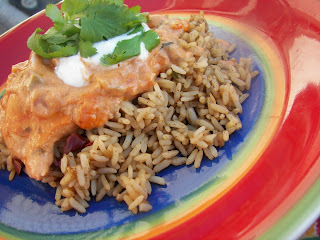 It is Zatarain's Dirty Rice; we love it! I will be posting this with Michael at Foodie Friday. Combine taco seasoning with sour cream, salsa, cilantro, and minced garlic, stir well. Place chicken breasts in 9 x 13 pan. Pour sauce mixture over. Bake in 350 degree oven for 35 to 45 minutes -- depending on thickness of chicken. Serve over rice. Looks and sounds great and seems fairly simple to prepare. I love just about any dish with a Mexican flare! Sounds really yummy. I love the name Chicken Ole! 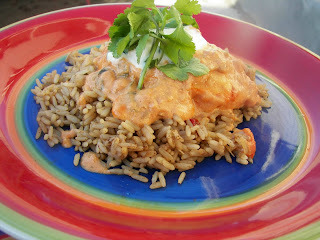 Joni, love the chicken recipe with all the sour cream and salsa. It looks delicious and is a keeper! I have a Happiness Award for you on my blog. Please stop by, pick it up and tell me 10 things that make you happy! I could live on Mexican food! It is so yummy and this recipe looks and sounds delicious! This is definitely one that Allie would like! I love easy meals that look this great! Have a wonderful weekend! That sounds so easy and so good. I think every one would eat that.